If you’re not worried about your blood sugar, I have some bad news. Because the odds of developing a problem with your beta cells… and blood sugar… are getting worse by the year. Over 30 million of our fellow Americans already have type 2 diabetes. And another 1.5 million are diagnosed every year. If you’re a senior, the outlook is even worse. Over 25 percent of folks 65 and older have the disease. And, of course, the complications of diabetes are as bad as the disease itself. With things like searing diabetic nerve pain, life-threatening heart problems, and blindness to “look forward to” avoiding blood sugar problems should be at the top of ALL of our lists. Of course, that’s easy to say. But NOT always so easy to do. You can start with the standards. Slice added sugars out of your diet, cut WAY back on empty carbs, and get up and move more. These oldies but goodies really CAN make a difference. But what if your numbers are still creeping up? Or if your doc has warned you that you’re already pre-diabetic? Then it’s hard to know what to do next. Well, a group of Brazilian researchers has a suggestion. They just uncovered a simple yet incredibly effective trick for essentially “retraining” your beta cells. I’ll tell you exactly how to take advantage of their discovery to lower your own glucose levels in just a moment. But first, let’s take a quick look at what beta cells and blood sugar have to do with each other. The human body naturally wants blood sugar to stay within a specific range. 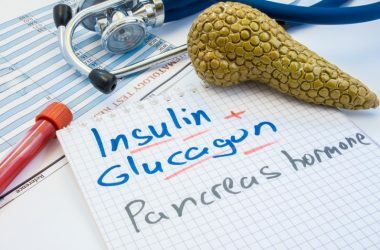 To make this happen your pancreas produces the blood-sugar-regulating hormones insulin and glucagon. Insulin is made when your blood sugar is high, and glucagon is created when it’s low. Beta cells in your pancreas produce and release the insulin. When they’re healthy, they quickly pump out the hormone in response to blood sugar spikes. The insulin instructs your fat and muscle cells to open up and let the extra glucose in where it gets used for energy. And at the same time, it tells your liver to store up any excess glucose for later use. But when insulin resistance, or pre-diabetes, occurs this process starts to break down. Your body builds up a tolerance to insulin. And it requires more and more of the hormone to convince your cells and liver to absorb the glucose. As the resistance gets worse, your beta cells struggle to pump out enough insulin to keep your blood sugar under control. Eventually, they just wear out from all the effort. And your body can’t produce enough insulin to keep up. This leads to pre-diabetes and finally type 2 diabetes. But those Brazilian researchers I mentioned earlier uncovered something that could help REVERSE this trend. A simple hack which essentially reboots your beta cells, so they start lowering your glucose again. It turns out plain old vitamin D could INCREASE your insulin sensitivity and IMPROVE beta cell function. And that means lower blood sugar and a reduced risk for type 2 diabetes. In the new study, the ladies who took vitamin D supplements OR spent more time in the sun were significantly less likely to have blood sugar issues. Across the board, higher vitamin D levels were associated with lower blood glucose levels. Which means one of the easiest steps you can take to maintain healthy blood sugar is to make sure your D levels are topped up. Your doc can give you a simple blood test to measure them. If you find yours are running low, try spending more time in the sun. A good goal is 15 to 20 minutes a day with your face and arms exposed. Eat plenty of vitamin D rich foods such as wild-caught fatty fish, eggs, liver, and cheese. And consider taking a vitamin D3 supplement. Be sure to eat plenty of magnesium-rich foods such as leafy greens and nuts too. Magnesium helps your body absorb and metabolize vitamin D efficiently. The time to worry about your blood sugar is NOW. Give your beta cells a boost with vitamin D.